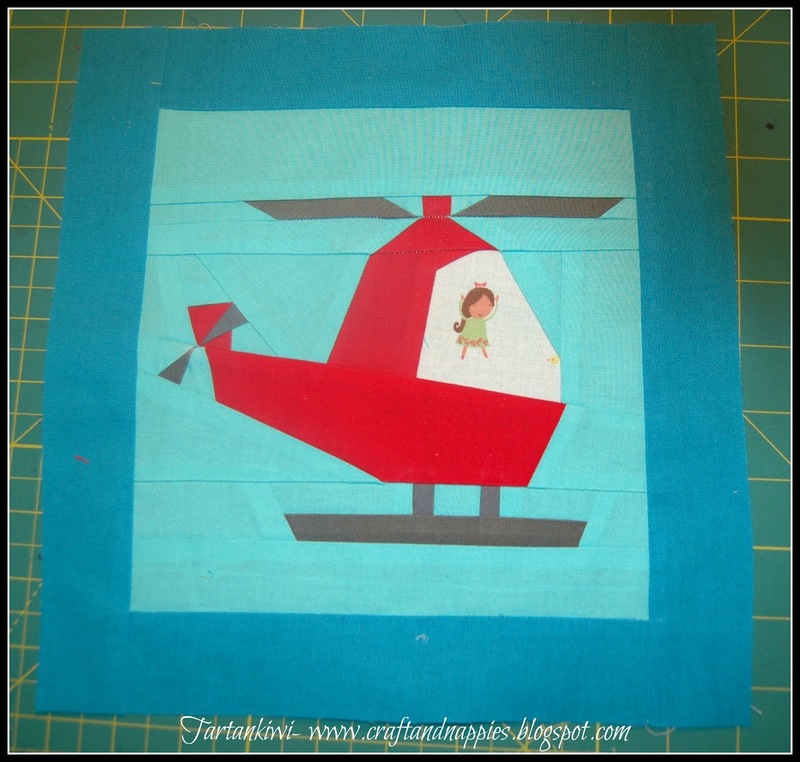 When Kristy told me about her idea to host a Blog Hop dedicated to using up stray paper pieced blocks, I knew that I had to take part (even though I have virtually no time available at the moment to make anything, let alone blog about it!). I wracked my brains to come up with a use for the two very cute helicopter blocks that I had made when road testing her awesome helicopter pattern. I hope you like the art folder that I came up with. oops! Rascal got hold of this before I managed to take final photos, hence the crushed corner! Apologies in advance, as I made the art folder pattern up as I went along and towards the end I got so into the sewing that I forgot to take a few photos- sorry! There was also some late night sewing involved so some of the photos are not the best (I'm having camera issues at the moment- grrr!). Please please please ask if anything is not clear and I'll do my best to clarify. 2 paper pieced blocks 8" blocks (unfinished size= 8.5" x 8.5") Alternately you could use two pieces of feature fabric or a combination of one paper pieced block and a piece of feature fabric. heavy weight iron-on interfacing = 21.5" x 11"
A piece of quilting fabric= 21.5" x 11"
heavy weight iron-on interfacing= 21.5" x 11"
A piece of quilting fabric for the notepad pocket= 10" x 16"
A piece of quilting fabric for the pencil pockets= 14" x 11"
Start by cutting all your fabrics. 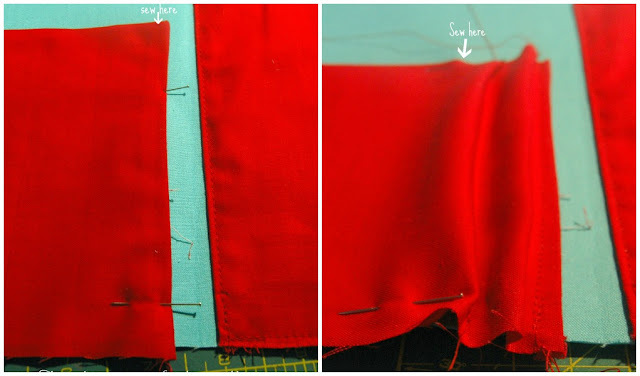 I should probably mention before we start sewing that all seam allowances in this tutorial are 0.25". 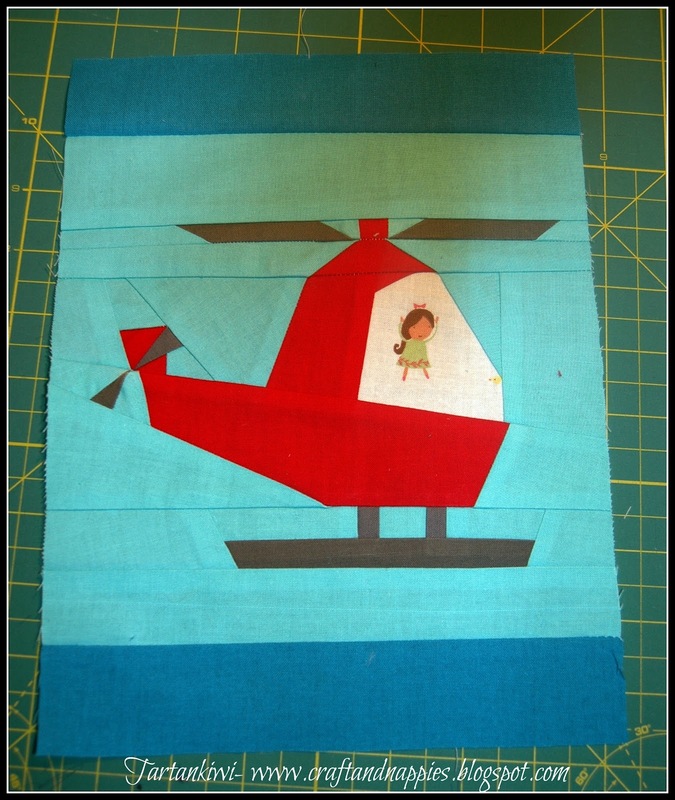 Take the 8.5" x 1.75" fabric strips and sew them to the top and bottoms of your paper pieced blocks. 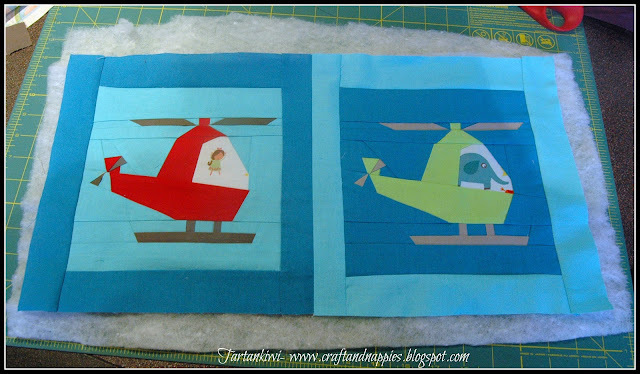 Now that your two blocks are framed, choose which one you want as the front and which will be the back. Then join them together. Lay your cover over the batting and baste. Quilt as desired (I used stippling around the helicopter and framed the paper pieced block with a line of stitching at 0.25" from the seam). Trim batting to size and then iron the interfacing onto the batting. Now lets start on the inside of the folder. 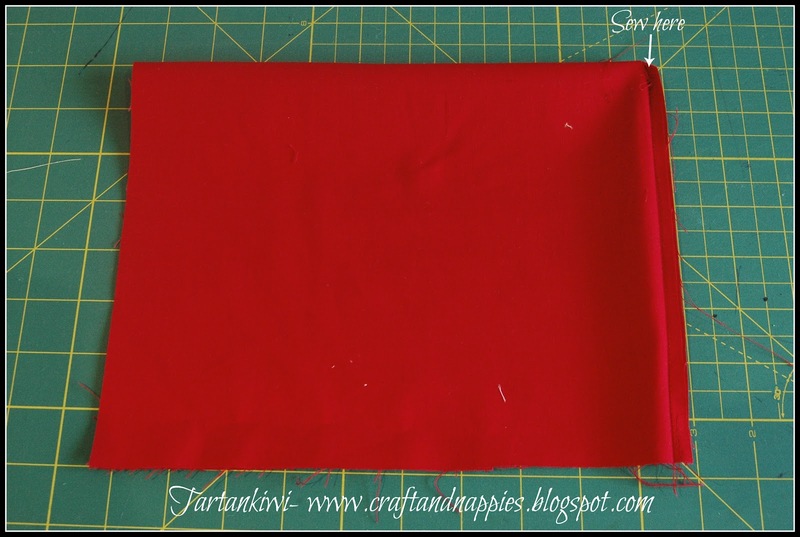 Take the large piece of quilting fabric (we will call this the lining from now on) and iron the interfacing onto the back of it. Take the 10" x 16" piece of fabric and fold in half making a piece 10" x 8". Sew down one of the 8" edges. Clip the corner, turn inside out and press. This pocket will be placed on the right hand side of the lining, with the finished edge in the centre. Decide on the layout that you want of this part of the holder. I wanted a large pocket for a notebook, a long thin pocket for a ruler and a couple of elastic hoops for a pencil sharpener and an eraser. You could add elastic hoops for scissors or anything else that you want if you want, let your imagination go wild! 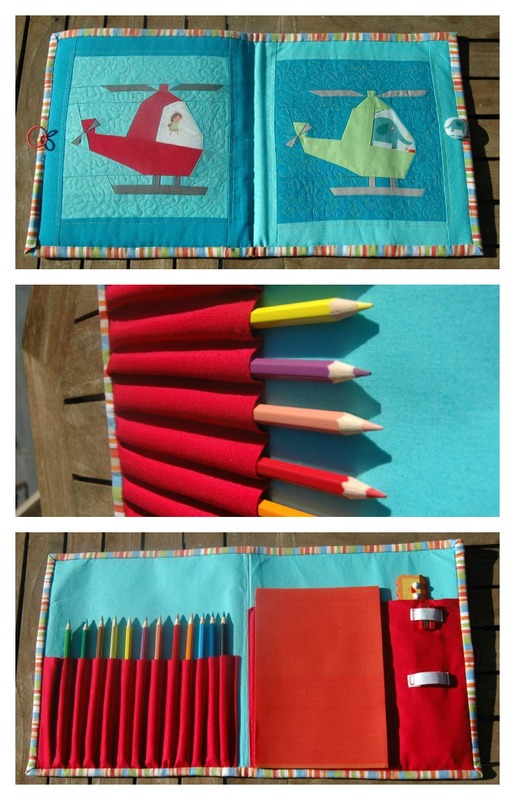 Now take your half inch wide elastic and place it on the pocket where you want your pencil sharpener holder to be. Place it over the pencil sharpener and measure how much elastic you will need. Cut to size. I like to use a small rectangle of stitches to attach these, but you don't have to if you don't want to. 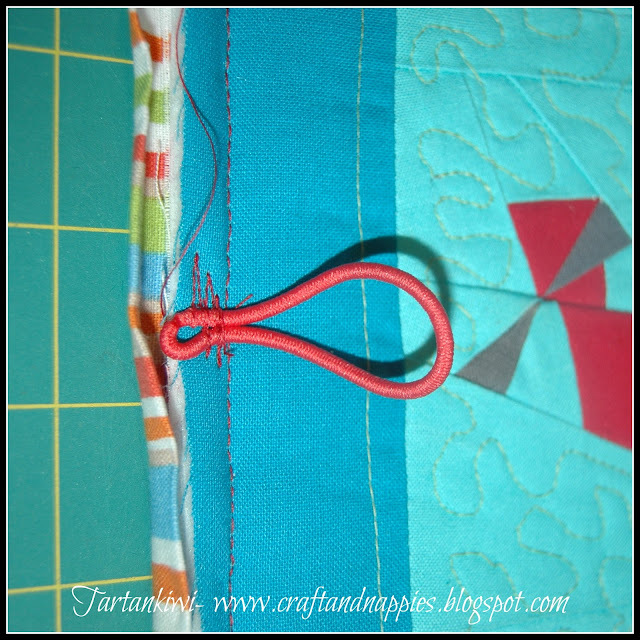 Use the same process to attach elastic for an eraser holder. 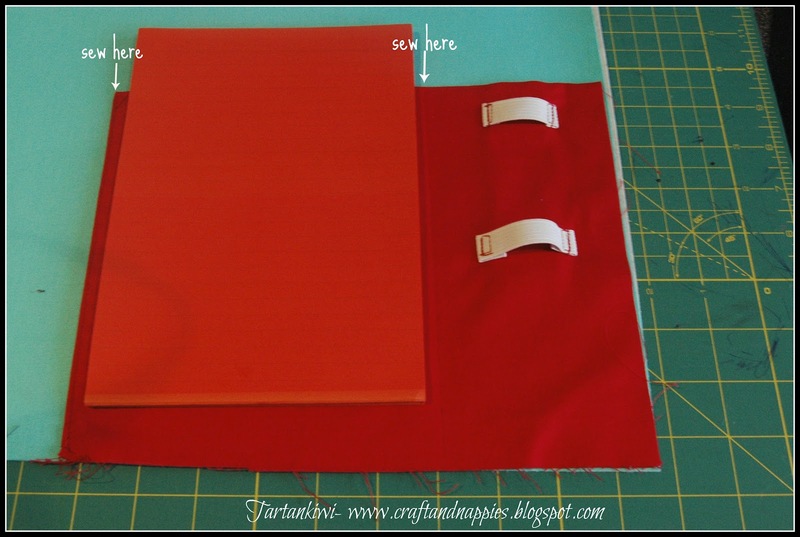 Place the notebook pocket on the right hand side of the lining, with the finished edge in the centre. 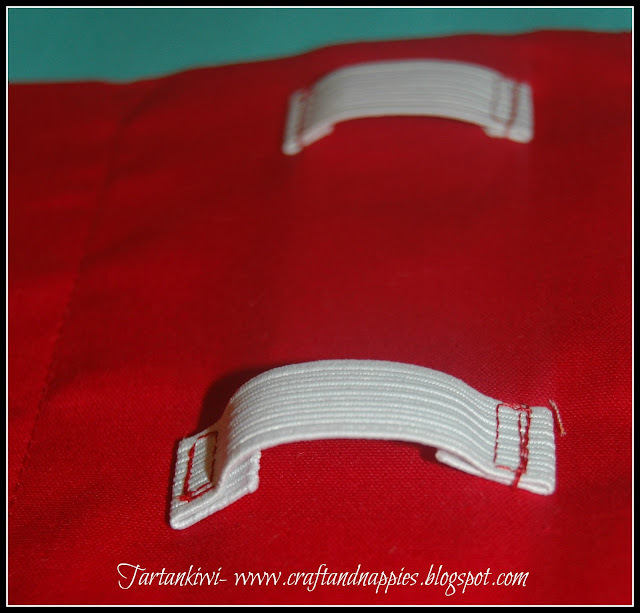 Sew the pocket to the lining. For the pencil holder, fold your 14" x 11" piece of fabric to make a piece which is 14" x 5.5". Sew down one of the short ends; clip the corner; turn inside out and press. Now take your water soluble pen and mark a line about 0.25" from the neatly finished short edge of this piece of fabric and then every inch along the rest of the fabric. Repeat this process put lines 5.75" lines at 5/8" intervals. I recommend starting close to the centre of your lining and working outwards as this will help you to leave extra width on the last slot and therefore allow for the bound edge. I have 13 pencil slots in my folder- enough for a 12 pack of pencils and an additional graphite pencil. Oops! Feel free to do it more neatly than I did! Starting at the centre, align the marks on the lining and the pencil pocket one at a time. Once aligned, pin and sew. 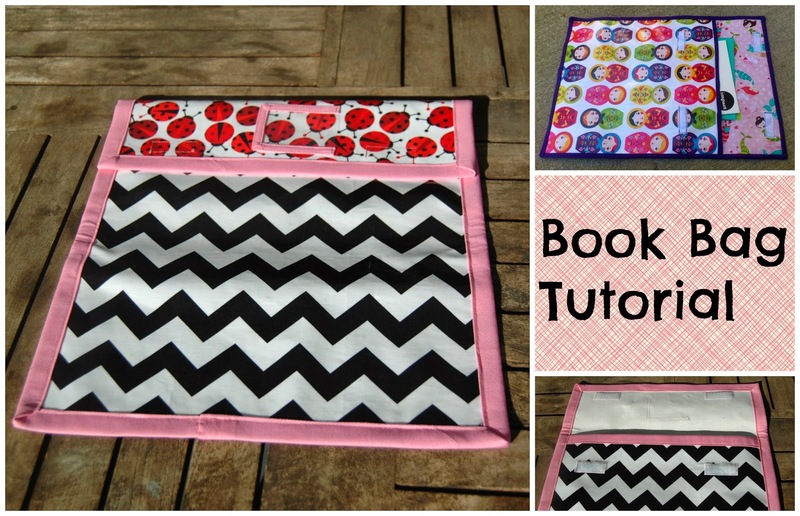 Once you have finished sewing the pencil pocket, lay your quilted cover right-side down on your table. Lay your lining right-side up on top of it. If necessary trim the edges so that everything matches up nicely. Stitch in the ditch down the join between the two framed blocks in the cover. 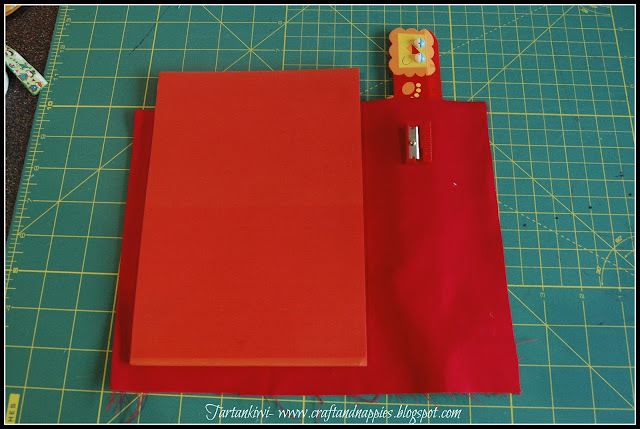 As this tutorial is already pretty long, I won't give instructions on how to bind this, but here is a great tutorial if you need some help. 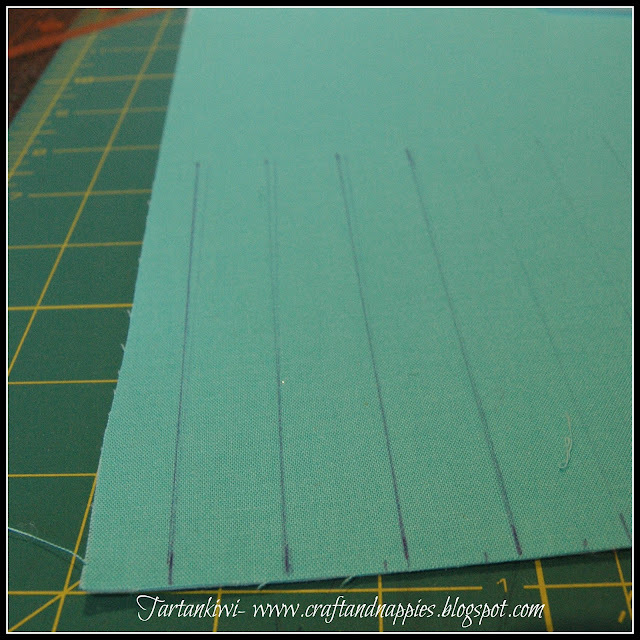 When you sew your binding on, start at the centre of the bottom and sew almost all the way around. Leave the bottom section of the back of the folder open. Now slide a sheet of heavy cardboard or stiff sheet plastic in before finishing off attaching the binding. Don't forget to attach the hair tie closure before you finish binding. At last, you can stand back and admire your handiwork- pretty cute eh! I hope you enjoy making these art folders as much as I enjoyed designing them! If you are brave enough to give it a try, I'd love to see pictures and to hear how you get on- Good Luck! 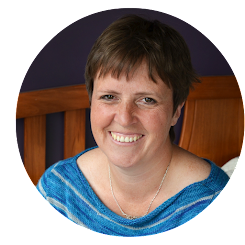 Now all that remains is for me to thank Kristy for inviting me to take part in her Blog Hop. Please do drop by some of the other talented participants- there have been some great projects so far! If you are new to these parts, feel free to have a nosey around and make yourselves at home- the more the merrier! What a great idea for those cute helicopter blocks! 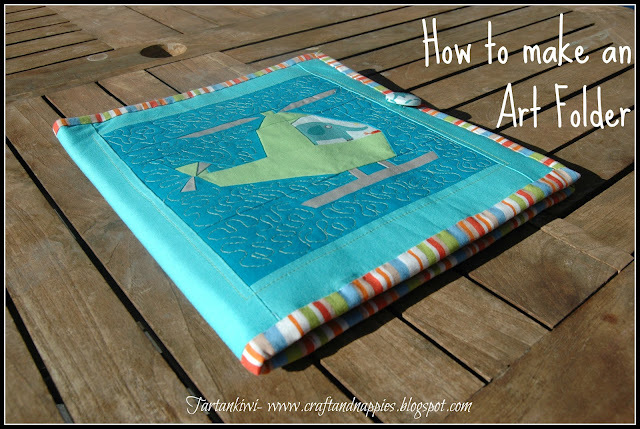 Your tutorial is really clear - I wonder if we will see art folders springing up all over blog-land! Wow, what a super tutorial and a great idea! That is an adorable gift I am sure any kid would treasure. I think your stippling looks great too, good work all around Juliet! Great idea! I like the helicopter. It's adorable!! And I love the fussy cut cockpit windows - what a great idea!! Thanks for this wonderful tutorial! Very clear and well-written, and with a lovely finished product! This is great! I love the little elephant in the cockpit. And the tutorial looks great as well. 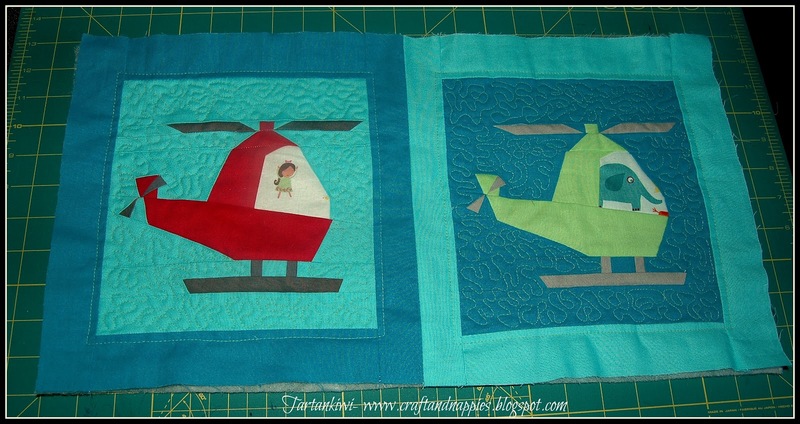 Great use of your two helicopter blocks. Thanks for sharing. I can see why you would have a few late nights with improvising a totally new pattern but it is really unique and totally desirable. 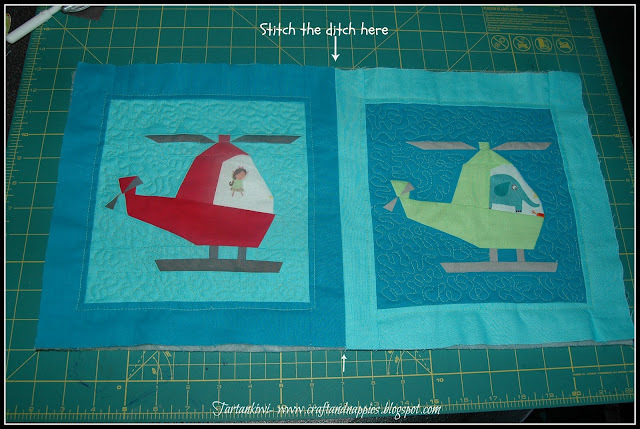 I am with the others who love the elephant pilot.I am going to pin your tutorial and try it once the Zakka Sew Along is done.